All steel and glass bolt together paneled cab that converts tractors open 4 post ROPS station to an enclosed operators cab. Cab does not meet ROPS requirements and must be used in conjunction with the OEM ROPS/FOPS. Cab includes front and rear safety glass windshields and front and rear electric wiper assemblies. Full backhoe operation is available from within the enclosure. The rear window tilts open for ventilation, and is fully removable for better visibility and flexibilty of operations. The cab enclosure includes a left hand hard door, sliding glass windows in the side rear panels. The right side is fixed with an upper hinged window that opens for ventilation. The backhoe will be removable without removing the cab. 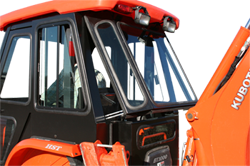 An optional filler panel is available to enclose the opening when the backhoe is removed. Cab height matches that of the existing OEM roof, measured from the platform floor. SPECIAL FIT-UP NOTES: Although the air-conditioning accessory 600-4242 is listed below for your reference, SIMS CAB DEPOT does NOT recommend any modifications be made to the FOPS structure for installation of this accessory. Any modifications to the vehicle's FOPS structure would void the FOPS certification. The optional Air Conditioning (P/N 600-4242) accessory offered below is for reference only, and is not a guarantee that this accessory fits and works with all tractor and engine combinations. Customer is responsible for ensuring sufficient engine compartment space and engine HP is available for mounting and powering the A/C compressor for their particular tractor and engine configuration.